Firstly I'm sorry but I only have one card this week.. My mojo is slowly coming back but I'm playing catch up at the moment. I have used a super cute image from Pink Petticoat which comes with the sentiment underneath already. It's printed onto Pistachio card stock from Stampin Up and then I have simply added liquid pearls to give it some dimension. Firstly I would like to apologise for my lack of comments over the last couple of weeks, but I have been enjoying a cruise to the Baltic, calling at Stockholm, Tallinn, St Petersburg, Helsinki, Warnemunde, Copenhagen and Kristiansand. It was a wonderful trip but, the internet on the ship was expensive and slow and I was also quite busily occupied most of the time. I hope to be back up to speed this week! 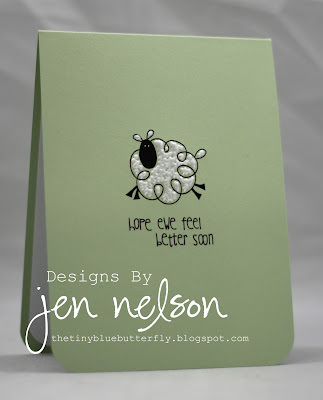 For this card I used the Framelit die as a template to shape the sentiment (which is straight) on an acrylic block. The stamp was then applied within the embossed arch, then the image was stamped afterwards. As ever I have a problem remembering the make of the stamps! These Stampin' Up stamps, although retired are some of my favourites. As these are two step stamps, I keep a piece of acetate already stamped with the coloured part of this card, in the box with the stamps to use with my stamp positioner. It saves having to stamp one each time I want to use the set! The sentiment is from Art Impressions. Beautiful examples ladies. Hope to get an entry in this week. SUPER tip on pre-inking a sheet and setting aside with set! Chrissie, you are right it does have a layer on it as I did not read properly the bit where it says one layer week. No worries I will re work it and replace, but not today! Great cards ladies. Sorry Chrissie my PC won't let me visit your personal website as it has malware! Great examples for our inspiration!! I love that you have this one layer challenge...it moves me outside of my comfort zone but I am learning and enjoying the challenge!! Love the simple clean lines of the cards - and how scrap booking doesn't have to be all about filling every littlelittle bit of the paper surface. Nice work. ShowCASe & Penny Black Winner!! !